It’s no secret that moving homes can be difficult. It can be stressful, and exhausting, and far too many things could go wrong. Nothing is worse than arriving at your new home only to find that some of your fragile items have already shattered in their boxes before you can even unpack them! Prepare your boxes. Tape down the flaps of your box in a ‘H’ shape, and then reinforce them with an ‘X’ going from each corner, across the center of the box. This added support is especially ideal for boxes intended for heavier items. Place heavier items at the bottom of the box, and the lighter items towards the top. If you’re packing food, place things like jars of peanut butter or pasta sauce at the bottom, and things like spices, biscuits, or crackers towards the top. When packing food products, always remember to tape open boxes (such as cereal, or biscuits) closed to avoid having their contents spill out. Also remember to cover the tops of your salt and pepper shakers with tape, or risk seasoning everything in your boxes with unneeded flavour. Glassware can be one of the most difficult things to transport in a move, but there are ways to make sure your more delicate items stay in one piece.Lightly scrunch up some tissue paper and place it into your box until you can’t feel the bottom. Cover this layer of tissue paper with a fresh few sheets as an added barrier for your glassware to sit on so that during the move, bumpy roads and sharp turns won’t directly impact their integrity. Wrap each glass in a sheet of tissue paper before placing them, side-by-side, into your newly-cushioned box. Add another layer of tissue paper between each new row of glassware, and fill any gaps with more of your scrunched tissue paper. Be sure not to pack the box too tightly, or too closely. If you’re moving stemware, make sure to pack the stem by squeezing tissue paper around it before placing the glasses in a box. Be sure to leave enough room at the top of the box for another layer of tissue paper to sit, so that both sides of your box have enough cushioning to keep your glassware unscathed. Pots and saucepans can take up a large amount of room during your move, but there are plenty of ways to minimise their volume. Fit smaller pots within your larger ones, and be sure to cushion between them with lightly-scrunched newspaper, or packing paper. 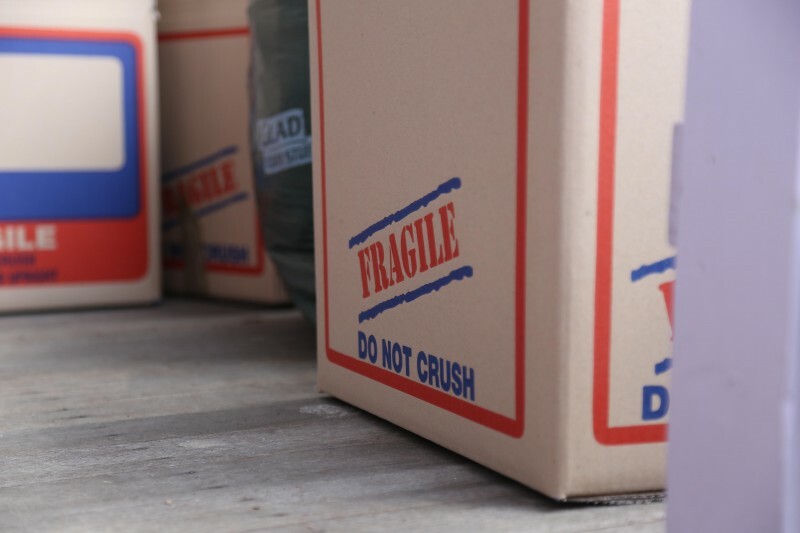 Saucepans can placed at the bottom of your boxes to leave plenty of room for more fragile, and lighter items to sit on top, just be sure to pack the space between to avoid more unwanted damage. Books are one of the easiest things to pack, but even still – it’s possible to make mistakes. Reinforce your box with extra tape before you begin packing it, and lay the books flat within. Make sure that you fill the box to the top, and that you don’t use a box that is too large, otherwise it might become too heavy for your movers to lift. Before packing your bathroom, take a moment to sort through your belongings and separate your daily essentials and medicines from the rest of your belongings. Pack them in a separate, easy-to-find box or overnight bag so that in the days immediately following your move, you’ll still have everything you need. Keep all liquids in leak-proof containers, and make sure that no shampoo bottles or conditioners are at risk of spilling open. Pack toiletries in small boxes, and if you’re concerned about leaks, use plastic bags. Never be afraid of using too many plastic bags to stop leaks, it isn’t something you’ll find yourself regretting. Place your brushes, hair accessories and makeup in separate, compartmentalised bags or plastic boxes. When it comes to smaller items, organisation is key. Tape bolts and screws underneath the furniture they belong to. Pack smaller, loose items in your suitcase to take with you, or sort them into larger containers such as a jewellery boxes, shoeboxes, or a resealable plastic bag. Clothes can be kept in dresser drawers to transport separately from a vanity, just be sure to cover them up prior to your move. Linens and towels can be used as packing material to wrap and cushion dishes, mugs and silverware. You might find you won’t even need a separate box for them! Always be sure to label every box you finish packing—you’ll thank yourself for it once you reach your new home. Fill every box to the top, even if it means adding more packing paper, and don’t be afraid to spend a few extra dollars on good quality, purpose-built moving boxes, it’ll save you a great deal of time and money in the long run. If the stress of a move is too much, if you just don’t have the time, or find the task too daunting to undergo by yourself, you could always hire a professional packer or two to come along and help you sort away a few of your rooms for you. Professional packers are trained specifically to know how to keep your belongings safe!